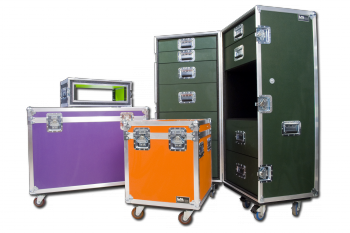 Our ATA Series cases are designed and built to meet the Airline Transportation Association Specification 300, Category 1 standards. This specification states that all shipping cases must withstand a minimum of 100 air shipment scenarios, including all ground transportation associated with each event. 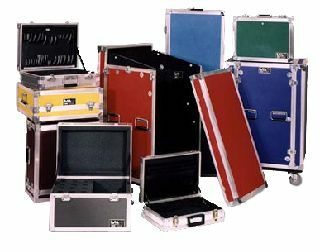 ATA-rated cases are available in both 3/8" and 1/2" plywood thicknesses. Choice of ABS laminate color. We also offer recessed hardware options with 1/4" ABS laminated plywood panels. Choice of ABS Laminate Color. Ask about our exclusive Composite Panel option! The economical version of our ATA Series, featuring surface-mounted hardware. Ideal for transit on company or personal vehicles and well-suited for both local and regional delivery applications. Features the same puncture-resistant, laminated plywood options as the ATA Series. Recessed mounted latches and handles are replaced with surface-mounted hardware – giving this case a high degree of protection with cost and weight savings. Available in a 1/4", 3/8", and 1/2" plywood thickness. Ask about our Composite Panel option! Provides excellent protection for small, delicate electronics; test equipment; sample cases; and tools. The XL Series features our unique "case-maker" tongue-and-groove extrusions, which wrap around the laminated 1/4" plywood panels. This gives the case solid aluminum side walls and a better lid closure. Available with surface hardware options and a 1/4" plywood thickness. LM Cases is more than just another Pelican distributor. We are a value-added, full-service foam fabricator with in-house engineering and fabrication capabilities. With our state-of-the-art CNC foam-cutting technology, we can deliver Pelican Cases with customized interiors within 5–10 business days. 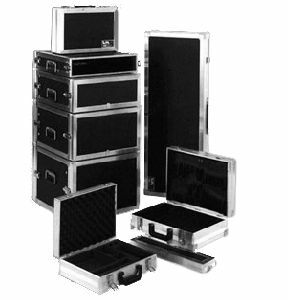 For Pelican cases with a generic interior, we offer next-day turnaround. Black cases are in stock; custom colors can be ordered. 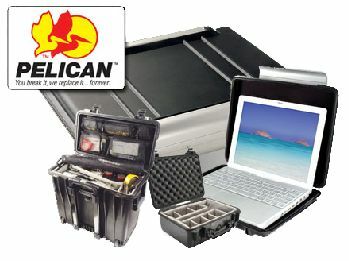 Pelican Cases are known for their durability, offering strong protection in a lightweight case. They are watertight, crushproof, and dust proof, and come with an Unconditional Lifetime Guarantee of Excellence.